A warrior in need of redemption. A young woman with scars that time won&apos;t heal. A love that will change their lives forever. A healer upon Dark Ages Isle of Skye, Eithni enjoys her life with the tribe of The Eagle. However, the scars of the past--and harrowing memories of the man who stole her innocence--make it impossible for her to find happiness. The &apos;Battle Eagle&apos;, Donnel, is a warrior of renown. Only bitterness has soured his character. He lost his wife in childbirth and now can&apos;t even bear to look at his son. The infant is a reminder of the woman he loved and lost. These days Donnel is intent on wreaking vengence upon the world. Although cowed by his anger, Eithni challenges Donnel about hisbitterness. She&apos;s determined to bring father and son together--even if he rejects her help. The Gathering of the Tribes upon the isle that summer changes Eithni and Donnel&apos;s lives forever. A chain of events brings them together, forcing them both to change and to open their hearts. But is love enough to heal the wounds of the past? 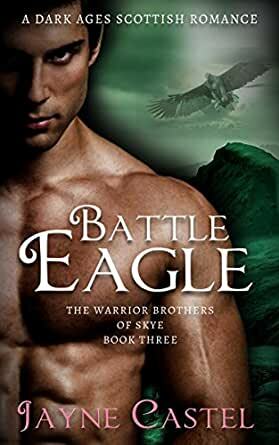 BATTLE EAGLE is the emotional third book in THE WARRIOR BROTHERS OF SKYE series. Follow the lives and loves of three warrior brothers: Galan, Tarl and Donnel. Fans of Historical Fiction, Scottish Historical Romance and Historical Action & Adventure. Those who enjoy Kathryn Le Veque, and who loved Donna Fletcher&apos;s Pict King series, should enjoythis series set in Dark Ages Scotland. Click &apos;buy now&apos; to start reading your copy of BATTLE EAGLE! I really liked the writing style, I was engaged throughout all 3 books and enjoyed all the characters and their love stories. Having loved the first two books in the Warrior Brothers of Skye, and already been drawn into the tragedies that surrounded both Donnel macMuin and Eithni, I was looking forward to reading this story - and it didn't disappoint. Donnel macMuin is a renewed warrior of the Eagle tribe on the dramatic isle of Skye who lost his wife in childbirth. He can not bring himself to look at his son, who robbed him of his love, and has poured all his anger and despair into fighting, winning himself a great name as a warrior. Only his self-destructive path brings trouble for his tribe. Eithni was left physically and emotionally scarred after her brutal treatment at the hands of the treacherous leader of the Wolf tribe (now dead). A skilled healer, she has set up a new life among the Eagle tribe, hoping to forget her past. Her great empathy and passion for healing draws her to Donnel, only the self-destructive warrior rebuffs her every attempt to help him. Battle Eagle is a fast-paced, intriguing and heart warming story that draws you into the world of Dark Ages Scotland. I thoroughly recommend. After reading the first 2 books in this series I anxiously awaited the release of Battle Eagle. The Warrior, Donnell ma Muin lost his first wife to childbirth. He felt I'll equipped to raise a child alone so he gives his son to others to raise He virtually ignores his son. Because of this he becomes angry and vengeful, a dark personality The heroine is Eithne is a healer who has been never expected of ever being married, because her innocence was taken against her will by one of the Chief's sons in the Wolf tribe So she leaves and joins the Eagle tribe to start a new life. Eithne likes the handsome warrior, but disapproves of the neglectful way Donne! is toward his son. Beautiful love story with healing of wounded would several twists in the plot that keeps you reading straight through to the end. Good Read and worth the wait. 5.0 out of 5 starsThis is a story of love, forgiveness, and redemption and I highly recommend it. I normally hate the last book in a series simply because they never deliver the same caliber work as the other books or because they never truly end the series with the same passion as the first books were written. I am very happy to say that this book breaks that tedious mold. Battle Eagle is as good as, if not better than the first two books in The Warrior Brothers of Skye series and gives the reader a sense of certainty that all three couples finally have a HEA. You do not need to read the first two books to come to love and root for Donnel and Eithni because Jayne Castel gives us their background in this story. They faced such hardships, anger, and pain in the past two books and continue to have them in this book that you want nothing more for them to finally find happiness. Through passion, pain, suffering, loneliness, love, and giving they ultimately find the person who is their perfect match, the other half of themselves. This is a story of love, forgiveness, and redemption and I highly recommend it. Couldn't put it down. loved both characters, they were broken and healed each other. loved how the relationship between them gradually evolved. loved the part of the book they were surviving alone, facing nature, it was interesting. well written, great pace, read it! i couldn't wait to read their story. Both Eithnie and Donnel had been broken. I thought it was going to be a bit darker cause of what Eithnie went through . There were times I felt like there was too much details in one or the other and not enough of them together. Towards the last half of the book though, the story really starts to take flight. Towards the end there is such heartfelt moments that the book becomes a very worthy read. Happy to have read this series. Definitely recommend it. But start it at Galans story of you haven't yet.